Church and Decorative Glass | King Glass, Inc.
King Glass of Monroeville, Alabama offers unlimited color and design options in our Krinklglas product line. Krinklglas is a cost effective alternative to stained glass windows, leaded glass and translucent glass. It is ideal for both interior and exterior installations. 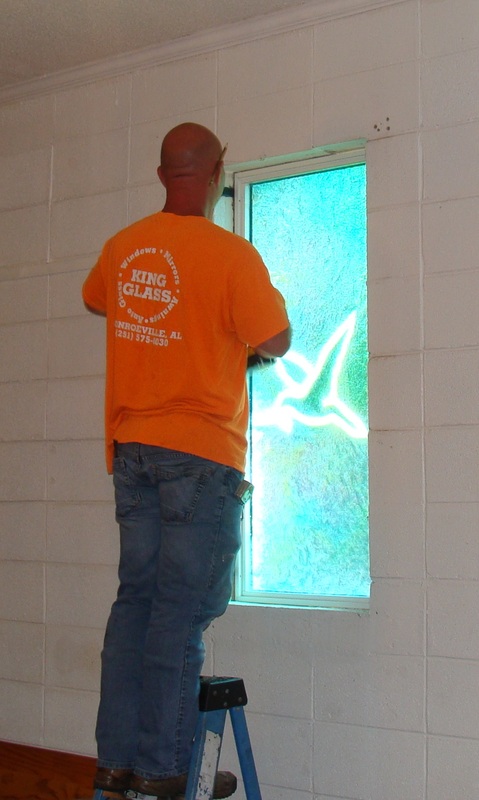 King Glass Technician installing Church Glass. These beautiful panels are made of fiberglass reinforced plastic that will reduce your energy bill and withstand the elements. Krinklglass windows will withstand the impact of stones, bricks, and bottles without shattering – eliminating the replacement costs of hazards and vandalism. With its textured surface it is scratch resistant. Click here to view our interactive color chart. Please call us with any questions or to request an estimate.